Did anyone fall for the fake Jason Derulo falling down the stairs at the Met Ball tweet? I nearly did! Always good to do a little research before you blog! A bit annoying that Anna Wintour tried to go a with a theme again, this time China. It does seem many ignored the theme anyway or paid it lip service. What is annoying is the whole who can reveal the most flesh competition that has degraded what was until very recently a celebration of beautiful craftmanship. Subtlety is dead and the whole thing seems to have adopted a Lady Gaga attitude of endlessly wanting attention for attention's sake. Next year let's rename it The Wacky Races! Anyway let's get to point of who rocked and who didn't hit the spot. This is what I mean by the Gaga attitude to fashion. It's only good in small doses dahhhhhlllings! I don't wanna pizza this action. Is it necessary to reveal everything? Peter Andre will need to look elsewhere for a mysterious girl. We demand the world acknowledges our chests! A shame as some of the detailing is lovely. This is simply amazing Sofia Vergara! Marchesa. 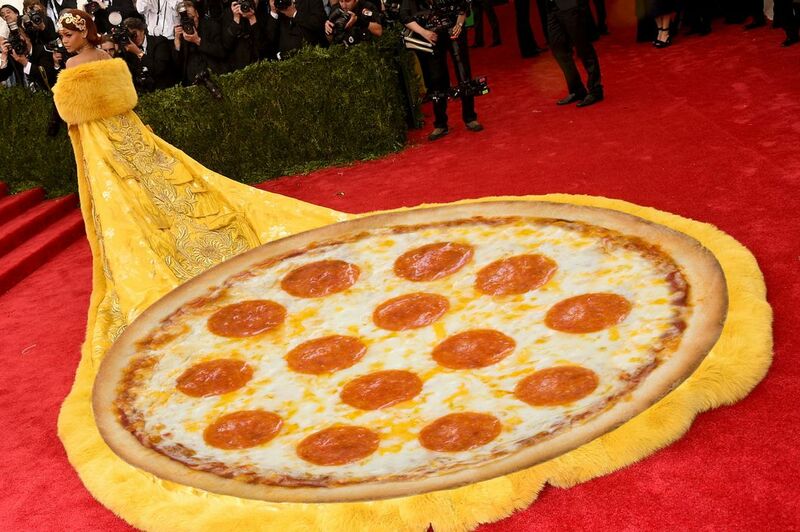 J Law's is good, just add a bit more fun to the bottom half. In a word Glum! This is not very approachable and bad customer service indeed. Jourdan Dunn is in the form of her life right now. Can she take the Number 1 model crown soon? Amal Clooney! I am really loving this! Another winner in Jason Wu red. Rosie goes from strength to strength. The next Gisele Bundchen? Bet that Alexa Chung is thinking I'm sticking to my normal safe colours next time. Interesting FKA Twigs and Robert Pattinson. Just needs more luxurious material. This is why having themes does not work. A bit like Abba week on the X Factor or even worse Big Band week on the X Factor! You can keep your shark bait pal. Respect to Lewis Hamilton for not wearing standard tuxes these days. Is this in the fast lane or the pits tho? Anna Hathaway must have come from an audition with George Lucas. Solange! This can't be you! Nooooooooo. A Prada fairytale for Kerry Washington. Dolce & Gabbana were not crowned winners with this Karen Elson outfit. Topshop at the Met Ball Hailey Baldwin?! Now the best attempt at the theme Irina and it's very flattering too. Hair would be better worn up. Where's the Olsens boat going to? The River Styx? The jacket is the highlight of Alicia Keys Jean Paul Gaultier outfit which at first I was not convinced about. This is a hit Cher. Madonna take notes s'il vous plait. I said take notes Madonna! Lovely hair tho. No one more fragile with the China theme. Why so serious Rita? Bumped into Calvin? J Lo you classy thing! Villain of the theme idea pays the price.